Thank you for taking the time to review Windham School District (WSD) programs and learn more about great things happening in correctional education in Texas. Windham has undergone tremendous change in the past two years. The challenges of teaching in the correctional setting have required our school district to be continually improving course delivery and course offerings to keep students at the top of the achievement curve. Read through WSD’s Annual Performance Report for School Year 2015-2016 (SY16) and you will see a significant range of improvements resulting in greater success for students. Two years ago Windham developed a plan to dramatically increase the number and type of vocational offerings in our schools while also advancing instructor training. Windham utilized the latest advances in predictive statistical analysis to guide these changes in coursework and to decide which new courses to add. These new courses have been designed, developed, and implemented to reach even more students while elevating the skill level of the overall training program. This has been accomplished by first offering basic or core courses to students for mastery of basic skills. These basic skills are then applied to a variety of “next step” training within more specialized areas, guiding students to reach for higher achievement and better opportunities for employment. “Next step” training is high level and in high demand. Employers are seeking skilled tradesmen, so Windham is offering many Science, Technology, Engineering, and Math courses to meet the need. For example, Windham is offering courses in copper and fiber optic cabling, Computer Numerically Controlled machinery operations, Electronic Service Technician work, and other areas of employment. Windham has also increased its success in awarding industry-recognized vocational certifications by more than three times the number accomplished three years ago: Windham delivered training leading to more than 18,000 industry certifications in SY16. Widespread vocational teacher training was also conducted this school year to further strengthen the vocational program while increasing student achievement. By changing the delivery of vocational instruction and improving teacher skill levels, students are receiving more advanced instruction and are better able to build a skill set within their areas of interest. Life skills courses taught by Windham show a significant reduction in recidivism, particularly within the Cognitive Intervention Program (CIP) classes. The effectiveness of this program, along with that of the pre-release CHANGES program, has also been heightened through changes in content and delivery. With the support of expert researchers in the field of criminal thinking processes, Windham has completely rewritten CIP and CHANGES curriculum. Enhancements and measurable outcome assessments have also been added to these valuable programs. In addition, WSD has trained all teachers of life skills classes using the newest teaching techniques, and we are confident this training will further improve student performance. Academic programs have also continued to improve through additional teacher training and expansion of services, including improvements for younger students and those with special needs. Through a large investment in technology, Windham has been able to provide computer-assisted learning components to improve student performance through blended approaches to instruction. The performance of students on assessments such as the Test of Adult Basic Education and the High School Equivalency Certificate (HSEC) test has shown improvement in course delivery, translating into student success in many areas. Windham also expanded offerings to reach more students by offering specialized teaching curriculum during WSD summer break. These Elective Personal Enrichment Classes are relevant and of high interest to students, with student response being overwhelmingly positive. privilege to partner with other public and private agencies, entities, and individuals who are dedicated to helping incarcerated men and women change their lives and find careers. Great challenges require great cooperation, so we welcome these connections. 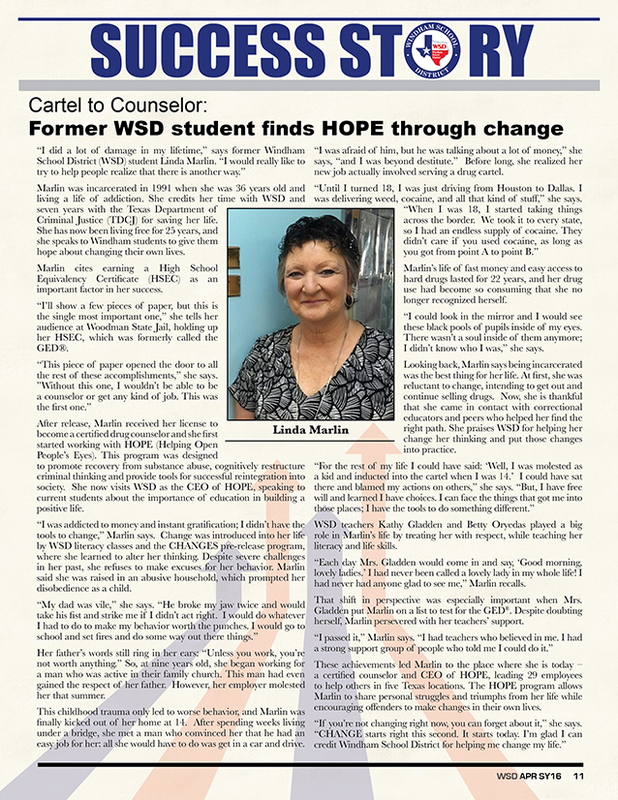 WSD is honored by the accomplishments of students who learn skills or obtain training from our classes, using it to reenter society, become contributing citizens, and rebuild families. Your interest and support are critical to meeting these challenges. If you have any questions, please do not hesitate to contact us. Together we’ll strengthen roadways leading to changed lives, a stronger workforce, and a better tomorrow. The possibilities for success are limitless.